SecretBuilders has partnered with LTL PRINTS to create ‘larger-than-life’ premium wall graphics ranging from laptop-sized to seven feet tall. 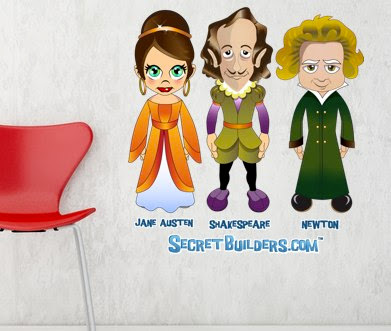 To celebrate this partnership LTL PRINTS is offering a special discount of $30 off SecretBuilders Famous Character Set of wall graphics using coupon code SB$30off. Get this set for only $45 - a $75 Value. The set includes three SecretBuilders cutouts of Jane Austen, Shakespeare and Newton, each 36" in height. These wall graphics are perfect for classrooms, libraries, daycare centers or a kid's bedroom. They are self-adhesive and will stick to almost anything (walls, windows, even ceilings! ), and can be removed and re-hung a 100 times without leaving a mark or damaging surfaces. Be sure to check out the SecretBuilders shop on LTL PRINTS for more great wall graphics!